The second set in Postphil’s series “The young of Iceland’s domestic animals” will be released in April this year. 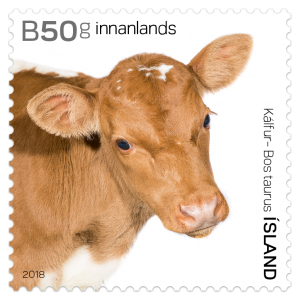 After kids and kittens in 2017, in 2018, the “animals of honour” featured on our stamps are calves and lambs. Spring in Iceland is absolutely fantastic – with days getting longer and migratory birds returning from their winter dwellings and singing their way through day and night, everything comes back to life after a long winter… then lambing season starts and suddenly the countryside is bustling with life and excitement! One of the most distinct features of Spring in Iceland are the lambs. The country counts around one and a half sheep per capita, or about 460,000 sheep for 340,000 inhabitants! Lambing season usually starts around Easter, between March and May – this year the first lamb was born on March 14th, which is exceptionally early! Ewes give birth after about 140 days gestation. 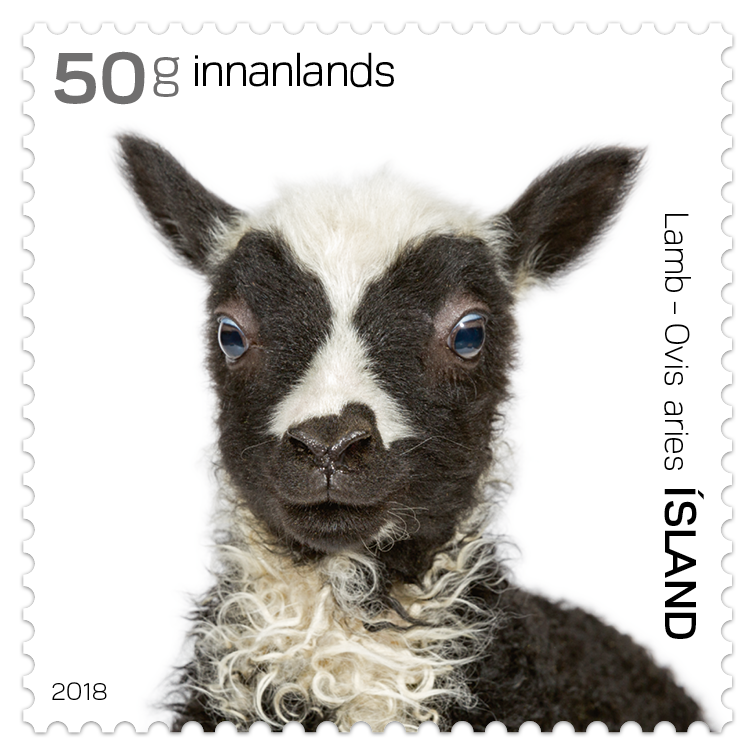 In Iceland, they most commonly give birth to one or two lambs, seldom three. If you drive through the Icelandic countryside on a Spring or Summer day, you will see lambs suckling their mothers or jumping around in the fields with gusto! In Iceland, it is not as common to see cattle out in the fields as to spot ovine, however there are a number of milking cows and calves. The length of gestation in cows is approximately nine months and they usually give birth to one calf. The first milk produced by the cow directly after calving is the colostrum. It contains nutriments essential for the newborn’s immune system. If you don’t make it to the countryside, you can see calves and lambs at the Family Park and Zoo in Laugardalur in Reykjavík. The Zoo includes most Icelandic animals, both wild and domesticated, from foxes, reindeer and seals to cattle, horses and of course sheep! 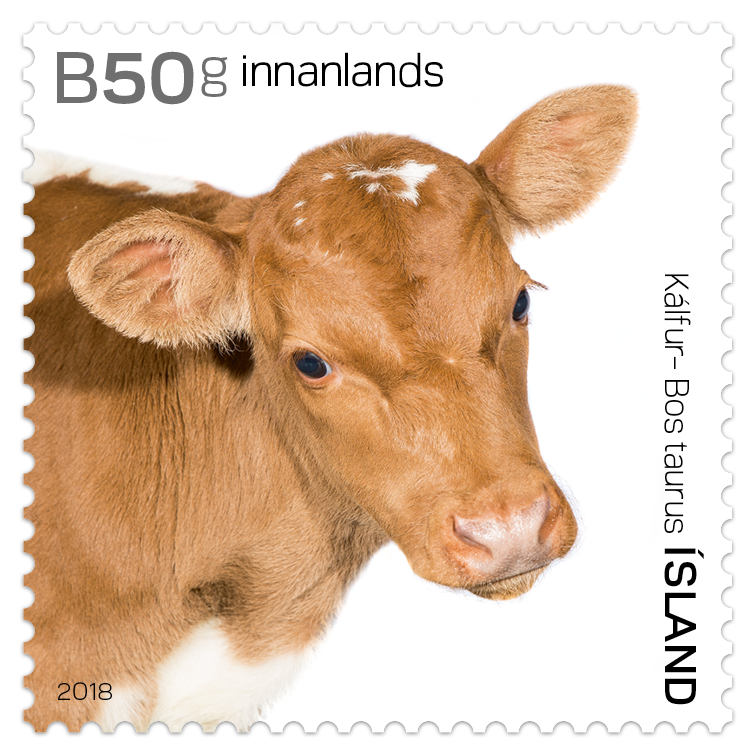 Both stamps were designed by Hlynur Ólafsson – photographs by Bára K. Kristinsdóttir.